Cheddar has a long and distinguished history. Scholars are divided on the true history of cheddar cheese. Some believe that this delicious and popular cheese began in Roman times, with the recipe traveling from Roman-controlled France into the Somerset region of England. Others believe that cheddar is a purely British invention. Whatever the true history of cheddar cheese, this beloved cheese has been enjoyed for many centuries and remains today the most popular cheese in Britain. Throughout ancient times, people made cheese to preserve milk. Cheese became a way for people to enjoy protein-rich foods throughout the long fall and winter months when cows produce less milk, or when traveling long distances. Hard cheeses became a staple of the Swiss farm pantry, with clever people transforming stale bread and cheese into fondue. Cheddar stands out, however, as having the longest recorded history. Many scholars believe that the Romans actually brought the recipe for cheddar cheese from Gual (modern day France). Soldiers and Romans moving from Gaul to Somerset, England, may have taken the French cheese-making process with them to create the first cheddar. But the fact remains that the oldest reference to cheddar cheese may be found in official documents. The pipe rolls, or scrolls housed in the British Exchequer or Treasury, contain the official account of money spent and received by the crown. In the year 1170, King Henry II bought a little over 10,000 pounds of cheddar cheese. The king obviously liked it and liked to serve it at court! The next major reference to cheddar comes from the writings of none other than literary lion Daniel Defoe. Defoe, author of many classic works, described in his book Tour Through the Whole Island of Great Britain the system by which farmers pooled their precious milk resources to make great wheels of cheddar cheese. Farmers in the 1720's brought their milk to what today would be called a cooperative. The milk was weighed and the farmer's contributions recorded. Only when the farmer contributed at least 100 pounds of milk was he entitled to a wheel of cheddar. He received in return an enormous round of cheddar cheese. Sometimes this took many months, especially for poorer farmers who owned only one or two cows. Another source of information along the history of cheddar are early cook books and books written to help housewives. Instructions for the frugal housewife are recorded in a book dating back to the early 1700's and penned by Eliza Smith. Her book, The Compleat Housewife, notes a popular recipe for cheddar and provides detailed instructions for those interested in making it at home. Most cheddar was made at home or in cooperatives like the one Defoe described. In the 1800's, Joseph Harding revolutionized the process of making cheddar cheese, thus adding an important note to the history of this venerable cheese. The Harding Method used to make cheddar includes a revolving breaker, a new machine that cuts the curds during the cheese making process by machine and saves the dairyman considerable time and effort. Harding's attention to hygiene and modernization of the cheddar making process earned him the accolade 'father of cheddar'. Harding and his wife are credited with introducing cheddar cheese into Scotland and North America, while his son, Henry, brought the process of cheddar making to Australia. During the 20th century, cheddar cheese suffered a setback. During World War II, when food was rationed during the war, the British government created one single type of cheddar nicknamed "government cheddar". This almost wiped out the cheddar industry and it took a while for it to recover. After World War II, only 100 dairies making cheddar cheese were left in the country. Prior to the war, there were over 3,000 credited with producing cheddar cheese. Cheddar cheese never lost its popularity. According to experts, only cheddar made in four counties is "true" cheddar: Somerset, Devon, Cornwall and Dorset. The slow food movement, which espouses locally made foods, claims that only cheese hailing from these four counties has a right to be called cheddar. Others may disagree. Today the variety of cheddar seems infinite. Mild cheddar is aged the least, while extra sharp must age at least a year to obtain the typical tangy flavor. Cheddar is always made from cow's milk. 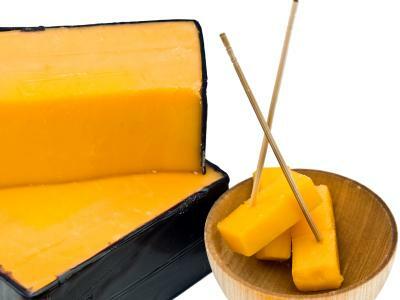 Cheddar in its natural state is usually white or pale yellow, but since the mid 1800's, natural food coloring has been added to turn it orange. Why this is so, no one really knows. Even Joseph Harding, the great cheddar maker himself, couldn't answer that question. White cheddar is typically called Vermont cheddar. According to cheese experts, in America the closest cheese to Somerset-made cheddar is New York State extra sharp cheddar or Vermont cheddar. Both types may be found at many large supermarkets or specialty stores nationwide. No matter what color, cheddar has a rich and storied history, and an even more rich taste enjoyed worldwide.